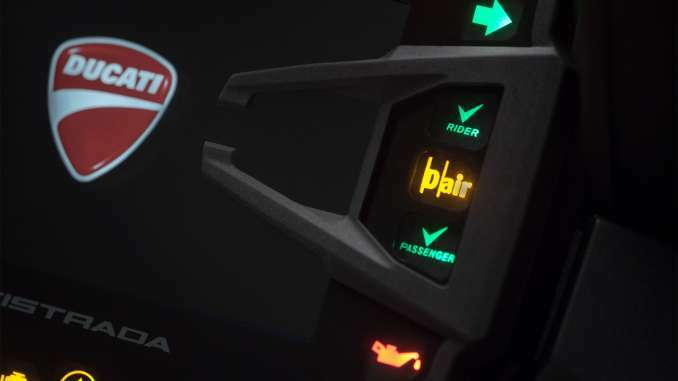 Cutting-edge safety technologies make the Multistrada 1200 S D|air® the first motorcycle incorporating an intelligent system wirelessly connected with the airbags inside the special Ducati D|air® apparel by Dainese. Made to inflate in just 45 milliseconds, the D|air® System will protect the vital organs of both rider and passenger aboard the Ducati Multistrada 1200 S.
D|air Street® is an innovative system for motorcyclists’ safety, designed for road use and composed of two separate modules: a unit comprising sensors and electronic components integrated into the on-board electronics of the Multistrada 1200 S D|air, and an airbag module fitted in the Ducati D|air Street® Jacket/Vest, available for rider and passenger. In case of a dangerous situation, on-board electronics wirelessly control the inflating of the airbag to cover those body parts most exposed to impact: back, collarbones, thorax. D|air Street® clothing must be purchased separately from the bike. During road use on asphalt, the D|air Street® platform is activated if there is an impact with a static or moving obstacle, a side or rear collision (if the values registered exceed the preset thresholds), and in case of impact against an obstacle following a crash or fall due to a loss of control, at a speed greater than 10 Km/h. The D|air Street® system works without any physical connection to the bike; the wireless technology on which it is based offers the rider and passenger optimum freedom of movement and allows for a rapid response to an impact (total activation time is 45 milliseconds) as well as effective protection during all stages of an accident. The D|air Street® system constantly monitors what is happening during road riding and, using a sophisticated activation algorithm, is able to distinguish between a non-dangerous situation and an impact or fall, only in this case will the system wirelessly inflate the special airbags fitted in the Ducati D|air Street® Jacket or Vest that, together with the back protector, protect the back, collarbones and thorax. In addition, D|air Street® limits extreme neck movement by reducing helmet oscillations while rolling. All of the electronics designed to manage system operation are completely integrated into the bike and only increase its weight by 1kg. The electronic system composes a series of three groups of accelerometers that can recognise dangerous situations: two at the front at the base of the fork (one on each side), and a third in the control unit under the seat on the left-hand side; the control unit includes the CPU with activation software, and the radio unit. An indicator set, displayed on the colour TFT dashboard, provides rapid information on the system’s operational status. 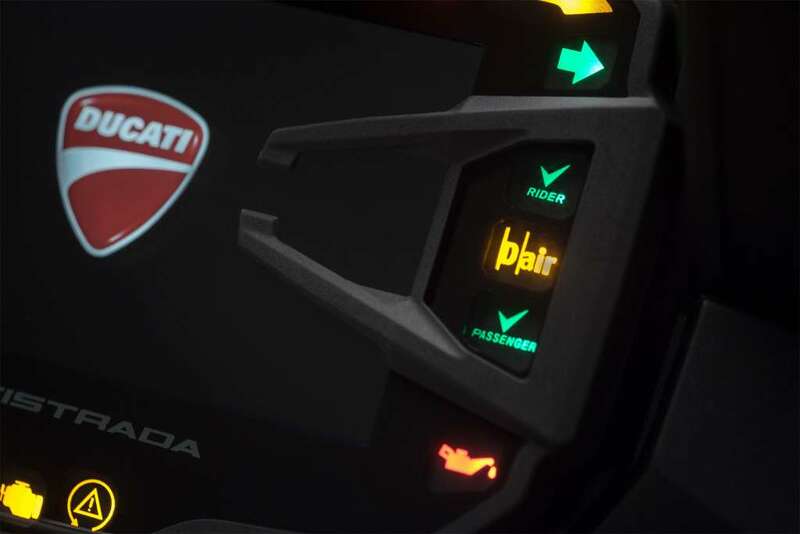 Items of clothing that form part of the D|air Street® system, to be purchased separately from the bike, consist of a textile Jacket and Vest with integrated airbag that communicate wirelessly with the Multistrada 1200 S D|air. 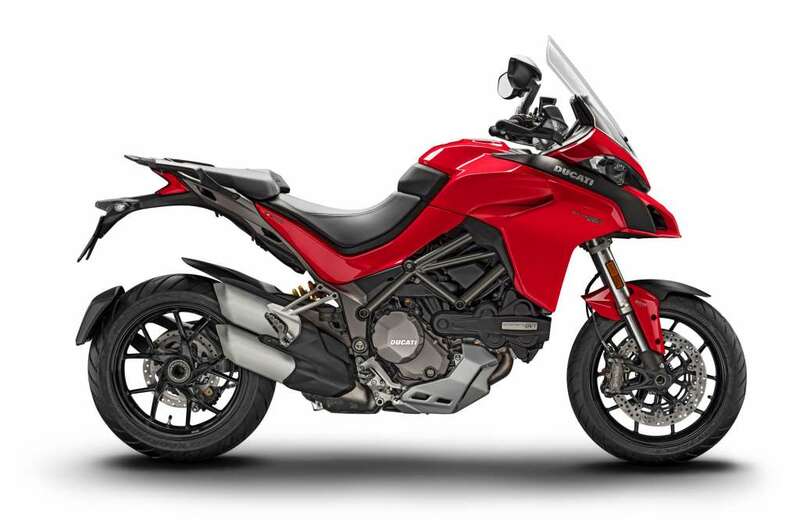 The Ducati D|air Street® Jacket, for long-distance touring use, provides maximum protection and comfort thanks to the D|air Street® airbag technology and GORE-TEX® membrane. The garment is equipped with: D-air Street® airbag, EC-certified protectors on the shoulders and elbows, Wave back protector integrated into a waterproof, breathable jacket with GORE-TEX® membrane and removable thermal liner. The Ducati D|air Street® Vest, which can be worn over any item of clothing, is protective and versatile. It is equipped with the D|air Street® airbag and certified Wave back protector. With both products, the airbag composes two air bladders, two cold technology gas generators, radio receiver and rechargeable batteries. The air bladders have a total capacity of 12 litres, are inflated at high pressure and produced using latest-generation, three-dimensional expansion control materials that, together with the high pressure inflation, allow the bladders to take on shapes and volumes designed to guarantee maximum protection from impact with minimal obstruction. In case of head-on impact, the D|air Street® system has a total activation time of just 45 milliseconds, much lower than the 80 milliseconds that European studies on the most common road accidents highlight as the maximum limit beyond which rider and passenger cannot be effectively protected. Tests carried out according to current European standards for back protectors (EN 1621.2) demonstrate that, compared to traditional back and thorax protectors, the airbags in the Ducati D-air Street® garments reduce the force transmitted to the body by 72% with respect to a level 2 EC-certified back protector and by 89% with respect to an EC-certified thorax protector. The system also offers added neck protection in that, by limiting the lean angle that the head might assume during a fall, it reduces helmet movement while rolling. The D|air Street® system, as well as being intelligent in avoiding any unnecessary or inopportune activation, is also totally harmless in all circumstances in which inflation of the airbags is necessary. The system has in fact been designed and produced so that in no situation does it provoke a loss of control of the vehicle or trauma from its activation.